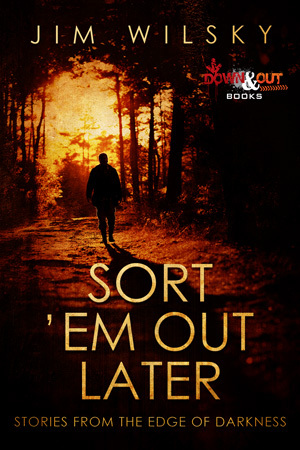 TAMPA, Fla. - May 29, 2018 - PRLog -- Down & Out Books is pleased to announce that SORT 'EM OUT LATER: Stories from the Edge of Darkness by Jim Wilsky will be published on August 27, 2018 in trade paperback and ebook formats. Malefactors is defined as "those who commit an offense against the law", or more simply put, "one who does ill toward another". This collection of short stories from Jim Wilsky is chock full of them. Tales that are all different, yet all the same. Jim Wilsky is a crime fiction writer. He is the co-author, teamed with Frank Zafiro, of a three book series; Blood on Blood, Queen of Diamonds and Closing the Circle. He's recently finished a new full length prequel to the Ania Series, titled Harbinger. His first solo novel, titled Cargo, is nearing completion. His short story work totals over fifty that have been published. They have appeared in some of the most respected online magazines such as; Shotgun Honey, Beat To A Pulp, All Due Respect, Yellow Mama, The Big Adios, A Twist of Noir, Rose & Thorn Journal, Pulp Metal, Thrillers Killers & Chillers, Fried Chicken and Coffee, Plots With Guns, Flash Bang Mysteries, A Twist of Noir and others. He has also contributed stories in several published anthologies, including All Due Respect, Kwik Krimes, Both Barrels and the soon to be released The Odds Are Against Us. Jim resides in Texas, supported and strengthened by a wonderful wife and two beautiful daughters.